anniversary | Randomwhoness: a Doctor Who blog by Johnny Spandrell. Sampling stories in random order. In Industrial Action, the ‘making of’ featurette on the Silver Nemesis DVD, writer Kevin Clarke says, ‘I would never again have the chance to write a show that included neo Nazis, creatures from outer space, Jacobean theatre characters, the Courtney Pine quartet and featuring an appearance by the Queen.’ But why stop there, Kevin? Throw in a couple of skinheads, a talking statue, a chess motif, a wacky American tourist and a pair of indifferent looking llamas. That’s Silver Nemesis for you – probably the strangest melange in Doctor Who history. It takes the show’s penchant for juxtaposition to an extreme. And the funny thing is most of it’s irrelevant. How odd to think that there’s loads of unused footage from this story – nearly enough for an additional episode – when what would really perk this tale up is to strip it back to a taut two-parter. So much of the story’s incident is superfluous; the visit to Windsor castle, the skinheads stuff, Mrs Remington – all this and more could hit the cutting room floor and all the better for it. You’d expect some colour and variety from Who’s 25th anniversary story. But despite all the hoopla listed above, it’s actually a low key affair as far as celebration’s concerned; more a subdued afternoon tea listening to jazz, than the raise-the-roof knees up of The Five Doctors. That’s all right, though. 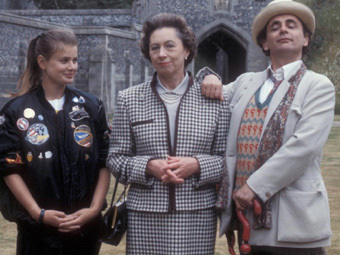 In 1988 we didn’t need a new multi-Doctor story or legions of returning companions. We were just happy the show was still on air. More recently, to mark the 25th anniversary of Silver Nemesis, we got The Day of the Doctor, and it’s a kind of hybrid of two types of anniversary stories. 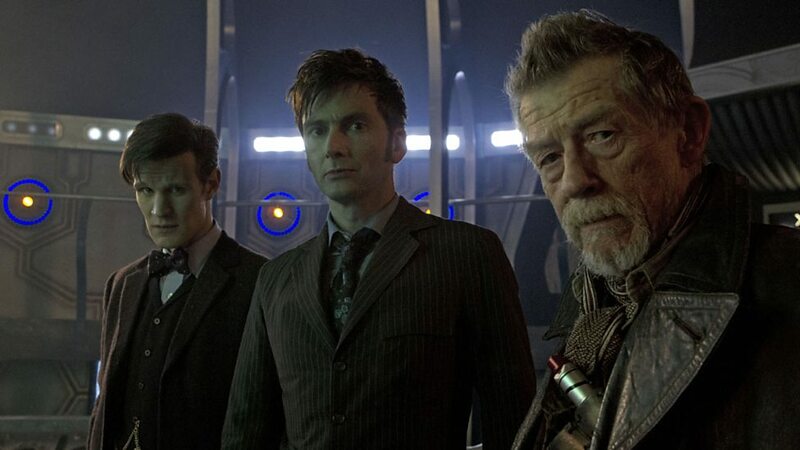 One, the full-on retro-looking multi-Doctor shenanigans, your Three and Five Doctors. And the other, a traditional runaround that also draws a line under the series’ past and pushes it in a new direction, as Silver Nemesis does. Or, I should say, as Silver Nemesis tries to. Andrew Cartmel, script editor for Old Who’s final years had correctly diagnosed a problem with the program; that we had grown to know too much about the Doctor, a character whose initial premise was one of mystery. So fundamental was the mystery around him that they named the series after it, but now the show seemed to be actively working against this idea. But Cartmel’s solution to this problem was frustratingly impotent. It was to hint that there was more to the Doctor than we knew, that he still had secrets left for us to discover. In Silver Nemesis, this idea is given a specific voice in the character of 17th century sorceress Lady Penelope Peinforte (Fiona Walker). Well, someone had to give her a first name. Somehow, Painfart has found out something scandalous about the Doctor. She skites about it at every opportunity, mainly to hairy offsider Richard (Gerard Murphy), who unsurprisingly, has no idea what she’s talking about. It’s a risky gambit, saying to the audience: ‘Hey! There’s something you don’t know’. OK, what is it then? ‘Not telling’. What is this dramatic piece of news which will have such an impact on our hero? The answer is of course… Nothing. Even if there was some ground shaking bit of info we didn’t know, revealing it would inevitably be an anti climax. It’s why, as Russell T Davies once said, we’ll never find out that the Doctor’s real name is Keith, because ultimately, the revelation adds nothing to what we know or care about. Silver Nemesis hints at a massive revelation about the Doctor, but then leaves it unspoken. Convenient really, because there isn’t actually one. The futility of this exercise is commented on in the last episode when Lady P finally gets around to spilling the beans, no one cares. ‘The secrets of the Time Lords mean nothing to us’ drones the Cyberleader, and sadly it’s true for the audience as well. The Day of the Doctor, on the other hand, pulls no such punches. It’s full of big, series shifting developments; the retconning of the Time War, the saving of Gallifrey and of course, introducing us to a hitherto unknown Doctor. It fires the bullets which Silver Nemesis merely loads. It’s got a confidence that Doctor Who in 1988 could only dream of. Unsurprising really, as modern Doctor Who has the unstinting support of the BBC and all the fanfare and marketing support of a major television event. Silver Nemesis was just another three episodes in a series it wanted rid of. As such, who can blame the production team – if not Cartmel then certainly producer John Nathan-Turner – for being risk averse. There would be no big narrative shifts which might make the programme’s position even more precarious. A couple of years before JN-T had vetoed a cliffhanger style ending to The Trial of a Time Lord for fear it would give the higher-ups an excuse to axe the show. This timidness survives in Silver Nemesis. Never mind, there are plenty of distractions to found along the way. It’s very 1980s for the Doctor and Ace to cart an enormous ghetto blaster around with them wherever they go, but I suppose patent law stops him from making her an iPod instead. Lady Paintcart goes completely eye rolling doolally in the final episode, delivering each line to some distant point on the horizon with increasing gravitas. Star of many a WW2 epic Anton Diffring was apparently baffled by the whole experience of making Doctor Who, but that steely gaze of his helps him transcend the whole videoy, synthy soundtrack look and feel of the thing. But really, it’s all a bit mad. You can see the whole approach to Doctor Who that ultimately leads to Dimensions in Time. But, amongst all the nonsense, Part Three suddenly livens up, with a sequence with Ace battling the Cybermen with a slingshot and an arsenal of goal coins, through an abandoned warehouse and atop its rusty old gantry. Suddenly there’s tension, with some nifty handheld camerawork making the viewer feel like they’re racing alongside the action. Ground breaking and courageous, Silver Nemesis is not. But it never stops surprising. LINK to The Impossible Planet/Day of the Moon. In both, the TARDIS flits around like mad between time zones and locations. The Eleventh Doctor asks for a fez and the Seventh Doctor wears one. And in both the monsters are tricked into initiating their own demise. NEXT TIME… You would make a good Dalek.